A year and a half after a stolen Willem de Kooning was recovered by the University of Arizona Museum of Art, experts at the Getty Center in Los Angeles are poised to begin a yearlong restoration effort that will reunite the painting with remnants that a thief left behind. The painting, Woman-Ochre (1955), was cut from its frame, ripped from its backing, rolled up and spirited out of the Arizona museum in a November 1985 heist. More than three decades passed before the owners of an antique store in Silver City, New Mexico, acquired it in an estate sale in August 2017 and, realising that it was a de Kooning, handed it over to the Arizona museum. Now the museum is preparing to send the painting to the Getty for a study and conservation effort led by Tom Learner, head of science at the Getty Conservation Institute, and Ulrich Birkmaier, senior paintings conservator at the J. Paul Getty Museum. Then the Getty Museum will prepare a conservation proposal for the University of Arizona Museum of Art. In the 1985 heist, a man and a woman followed a staff member inside the Arizona museum soon after the institution opened. While the woman distracted a security guard, the man went upstairs and sliced the de Kooning from its frame, ripping the canvas off its 1974 backing and rolling it up. The F.B.I. is still investigating the case. Birkmaier says that conservators plan to reattach Woman-Ochre to the remnants that were left behind on a stretcher at the Arizona museum, probably through a relining, and restore the work to its original dimensions. The cracking paint will need to be secured, he says. Learner says “the big unknown” is “whether, once the painting is secure and back at its original dimensions, how much repainting or retouching is needed.” He predicts that the study and conservation process will take about a year. Then the Getty will put the work on view in the summer of 2020 in a presentation that will also dissect the conservation process before the de Kooning is returned to the University of Arizona Museum of Art. The Arizona museum plans a bon voyage party for Woman-Ochre: on Sunday evening it will go on view at a party at the museum that is open to members of the public ($95 for museum members, $125 for nonmembers). Museum officials declined to estimate the value of the work; in November a 1954-55 painting in de Kooning’s legendary Woman series went for $68.9m, including fees, at auction in New York. 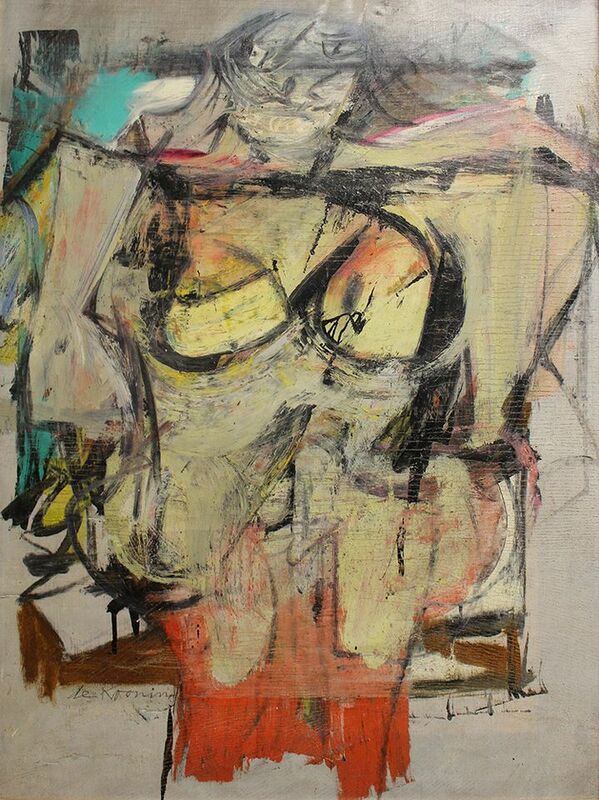 David Van Auker, one of the three owners of the antique store that acquired the de Kooning, said in an interview that he first saw the painting in August 2017 after being approached by a nephew of a deceased couple who was seeking to sell the contents of his aunt and uncle’s home in Cliff, New Mexico. Visiting the home, he noticed that the painting was hanging behind a door in the master bedroom. He said he valued the work at around $200 and agreed to pay the nephew a total of $2,000 overall for the contents of the home. Two other customers also inquired whether the painting was a de Kooning. “I kind of started to wonder,” Van Auker says. “It was probably in the store two or three hours before I googled it.” He quickly learned of the 1985 heist and found an image of the painting: in 2015, the Arizona museum had publicised the 30th anniversary of the theft in the hope that the de Kooning might yet surface. Van Auker and his partners immediately notified the Arizona museum of their discovery and emailed photographs of the work. Worried about the painting’s safety, Van Auker took Woman-Ochre home that night, tucked it behind a sofa and began an all-night vigil. “I sat up all night on the sofa with a gun with the de Kooning behind me,” he said. Officials from the Arizona museum arrived the following evening to take possession of the painting, he says.